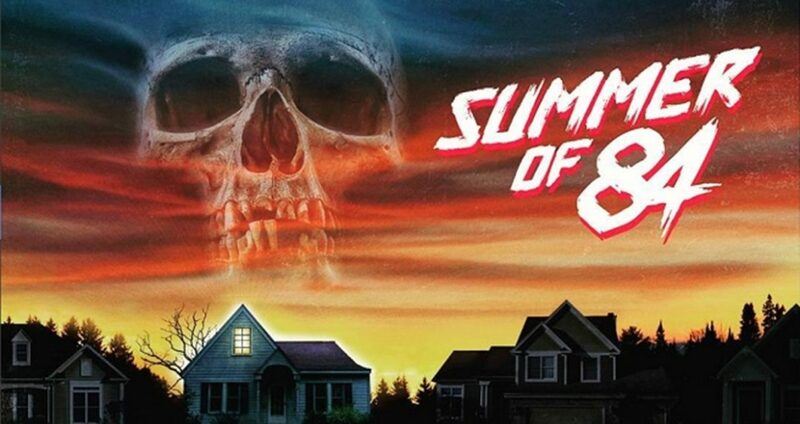 Tag Archives for " RKSS "
RKSS films, the people who brought you “Turbo Kid,” are back with another slice of 80’s nostalgia in “Summer of 84”. Given the sea of 80’s inspired TV shows and movies that have come out in recent years, this might be seen by some viewers as a bad thing. Also given this is a Coming-of-Age thriller there will be inevitable comparisons to “Stranger Things” even although the plot is entirely different. The central story focuses on Davey (Graham Verchere), a conspiracy-obsessed teen who starts to suspect that his next-door neighbour Mr. Mackey (Rich Sommer) is a serial killer. His friend’s Dale (Caleb Emery), Tommy (Judah Lewis) and Curtis (Cory Gruter-Andrew) are initially sceptical about Davey’s theories but eventually decide to go along. The group’s investigation takes up the bulk of the movie. As a horror, it is a slow burn affair which focuses more on creating a foreboding atmosphere rather than gory thrills. Also while some may guess early whether or not the next door neighbour is indeed a serial killer the filmmakers do well to keep the mystery going throughout the film. There is much to admire here as the period detail is excellent and it is clear to see the filmmaker’s genuine love of all things 1980’s. There is no sense that this is cynical bandwagon jumping. It is also clear that they wanted to make their own story within the 80’s style and not just be a mere pastiche of the movies they are paying tribute too, such as Amblin films. Some of the classic 80’s elements really work too, from an entertaining investigation montage scene to the synth-heavy soundtrack. Not everything works so well though. As while the central character of Davey is likable and compelling, the rest of the gang seem both annoying and underwritten. Particularly Tommy who is that archetypal obnoxious loudmouth character whose behaviour is excused by the fact that he has terrible parents and an even more obnoxious brother in what seems like lazy writing. Talking of lazy writing the only female character of note, Nikki (Tiera Skovbye), is risibly underwritten cool dream girl who only real purpose is to be pined after, and become a quasi-love interest, for our lead. However, Skovbye does her best to give the character some spark. Some lazy writing aside there is much to enjoy here, and the film cranks into gear in the final stretch paying off all the tension that was expertly built up throughout the film. Overall: “Summer of 84” is not doing anything new and can at times feel clichéd but it also a highly enjoyable Coming-of-Age story with a decent lead performance, engaging plot and a cracking synth score.